I have discovered many of the working features of the PSR-2000 by trial and error. My manual has been nearly destroyed because of its use or should I say non-use. 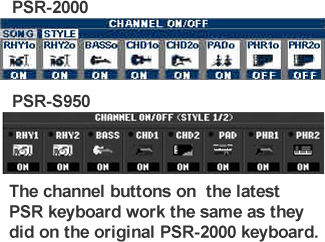 I came across a feature the other day that is not directly mentioned in the manual and I thought I'd pass my discovery on to the PSR-2000 tutorial site. I change the voicing of the various rhythm tracks all the time (change the bass, the drum kits and the other voices in the pad, chords, phrase, etc.). I used to go into the Mixing Console to do so, but found a quicker way and one I can use while I am actually playing the song. Now that the tracks are shown, you can hit the Upper button for the track you want to change and the main screen will immediately go to the current voice assignment, which you can change by selecting another voice. You can even use the UP option to go up one level and select an entirely different group of voices. If you hit the lower button, it will turn off that track completely. If you hit the lower button again, it will turn the track back on. If you hit the lower button and continue to hold it down for a few seconds, it will go to a "solo" mode for that accompaniment track and the only accompaniment you will hear is that particular track instrument. (In this mode, you can still hit the upper button and try out the sounds of different instruments.) Hit the lower button once more and you will exit solo mode and all the tracks will be on. You may have already discovered this, but it has become an option that I use almost with every song. It is amazing how different a song can sound by changing the voicing. This page updated on March 9, 2015 .